LONG BEACH, Calif. /California Newswire/ — Art-In-Relation (AIR), a new non-profit Long Beach based Arts Organization will be holding its first fundraising event on Sunday, February 22, 2015 beginning at 2 p.m. at Ernest Borgnine Theatre in Long Beach. The event is called "Fresh A.I.R. – a Broadway Benefit." The event will feature dozens of actors, actresses, dancers, singers and musicians performing works from Broadway and focusing on productions that Art-In-Relation will fully produce in 2015 and 2016. Performances will include solo, small ensemble and large ensemble numbers from shows such as: "Joseph and the Amazing Technicolor Dreamcoat," "Matilda," "Blood Brothers," "Les Miserables," "Chess The Musical," "The Hunchback of Notre Dame," "Spamalot," "Forever Plaid," "Pirates of Penzance" and more. Proceeds benefit Art-In-Relation and The Long Beach Scottish Rite Childhood Language Center. Tickets are $60 per person or $500 per table that seats ten (a $100 savings) which includes a dinner buffet served in the Scottish Rite banquet hall house following the performance, in the same building with the Ernest Borgnine Theatre, located at: 855 Elm Avenue, Long Beach, CA 90813. Tickets are available by calling 1 (800) 838-3006 or online at http://freshair.brownpapertickets.com. There will also be a cash bar, but wine is included at each table with dinner. The schedule is as follows: 1:30 p.m. preshow reception with cash bar in the President's Room (near the theatre entrance on the second floor of the Scottish Rite Event Center). 2 p.m. performance in the Ernest Borgnine Theatre, 4 p.m. Dinner served in the Banquet Room with live music. Broadway alumni Richard Kinsey; known for his portrayal of Javert in "Les Miserables." He starred in the Broadway, National and International Touring Companies, and performed the role over two thousand times. James C. Mulligan, is an Irish American artist and actor best known for painting celebrity fine art and commercial murals. His stage work includes "Jekyll & Hyde," "Les Miserables," "Miss Saigon," and "South Pacific" with Reba McEntire. Kinsey publishes a series of children's books with original art he has created. Mulligan is a world renowned for creating fine art for celebrities, specializing, but certainly not limited to Disney works. Both Kinsey and Mulligan will have works available for silent auction at the Art-In-Relation event. Kristin Towers-Rowles is a third generation Musical Theatre actress from a very musical family. Her grandmother was the MGM Film actress, Kathryn Grayson. Towers-Rowles never stops working – performing in productions, cabarets and one woman shows throughout the West Coast – and when she's not performing she is directing. Alphonso Freeman is the son of film icon, Morgan Freeman. He has appeared in such films as "The Shawshank Redemption," "Seven," "Nurse Betty," "Ten 'til Noon" and "The Bucket List." He also has performed Shakespeare and other works of theatre regionally. The Los Angeles Musical Theatre Youth Chorus (LAMTYC) is an innovative youth chorus that sings with great vocal technique while focusing on the repertoire of "Broadway" and the "American Songbook." The Cast of "Forever Plaid" – an off-Broadway musical revue written by Stuart Ross in New York in 1990 and now performed internationally. The show is a revue of the close-harmony "guy groups" like The Four Aces, and The Four Freshmen, that reached the height of their popularity during the 1950s. AIR's production of "Forever Plaid" will star: David Kenny, Tim Hearl, Jonas Sills and Ray Buffer. The Plaids will emcee the Fresh A.I.R. benefit and perform a few numbers. Other wonderful performers include: Paul Thorn Bacon, Nichole Beeks, Tim Cable, Cynthia Caldwell, Abby Carlson, Breanna Carter, Michelle Castillo, Michelle Chaho, Brittani Clements, Shannon Cudd, Javier Delgado, Ashley DeMatteo, Travis J Dixon, Jason Wesley Green, Dave Hardenbrook, Kayla Hasler, Takaaki Hirakawa, Jenny Hoffman, Dominique Johnson, Casey Lebold, Polina Matveeva, Benjamin McNamarra, Kate Metroka, Narumi Nakayama, Gus Peroba, Perry Shields, Heidi Sill, Genevive Simon, Jennifer Walquist and Warren Wigus, with instrumental performances by Ron Berman, Kendra Lynch-Vuk, Gary Fritzen, David Sills and Robert York. 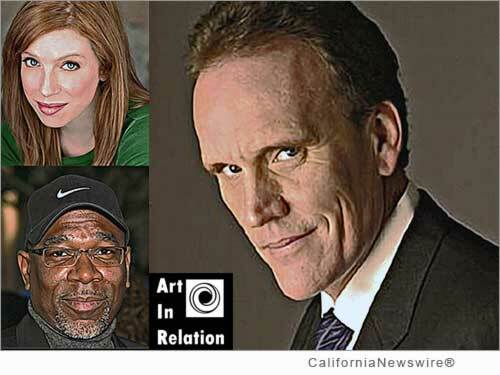 Founded by Long Beach actors/singers/producers, Jonas Sills and Ray Buffer, Art-In-Relation (AIR) is a non-profit arts company based in Long Beach at Ernest Borgnine Theatre that produces theatrical productions. AIR offers real world experience to new and upcoming artists outside of the world of academia, pairing emerging professionals with established professionals in a performance environment. The Long Beach Scottish Rite Childhood Language Center (LBSRCLC) is committed to providing high quality services to preschool children with language disorders. Through early identification and treatment of language disorders and parent training, LBSRCLC believes that early intervention contributes to the possible prevention of further delays and curtails the development of secondary problems such as behavior, emotional and learning problems. After diagnostic evaluations, parent training is a vital and unique part of the program. By watching and participating in the speech and language therapy sessions, parents learn how to work with their children at home. All services are offered for free to families. Learn more: http://lbscottishrite.org/ .